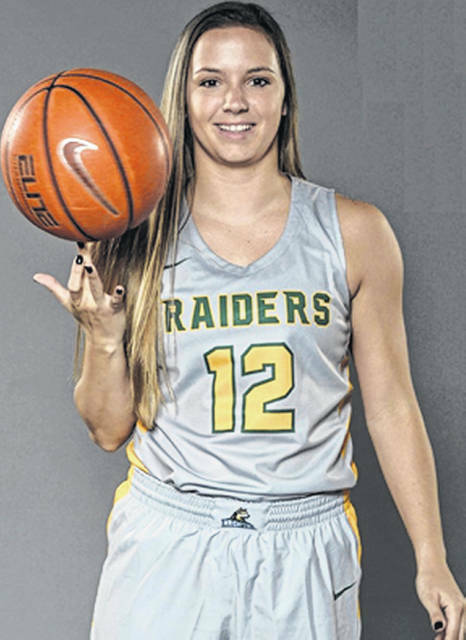 FAIRBORN — Wright State senior guard Mackenzie Taylor won’t let much back her down, both figuratively and literally. Currently, Taylor is just 71 points shy of reaching the 1000 point milestone for her career at WSU, but being the selfless athlete she is that isn’t her primary focus at the moment. “It’s been a topic of discussion, but it’s honestly something I don’t really want to worry about right now,” Taylor said. This opportunity nearly didn’t have the chance to happen. Throughout her career, Taylor has dealt with some lingering back pain brought on by two bones that are fused to a bone in her lower back called the sacrum, an issue that a small percentage of the population has. This can be compounded as the season progresses, and she manages it with painkilling injections. It was an injury that occurred when she was in high school at Richmond in Indiana that she says helped give her that enhanced toughness. The unrelenting support of Merriweather has also helped her overcome adversity. On the court, Taylor has made a name for herself as a sharp shooting three-point threat. She is fifth in WSU history in shots made from behind the arc (178) and third overall in percentage (.346). Reps are vital in keeping that skill intact she added. Reflecting on her time as a Raider, Taylor has no doubt that she made the right decision to attend WSU. Playing alongside WSU guard Emily Vogelpohl and 1000-point club member for four years has benefited Taylor as a competitor. With her ability to lead the team, Taylor is like a second coach on the floor. As an accountancy major, she feels that experience could be useful in the future. “It’s helped me be disciplined working with a variety of people. Being on a team, everyone comes from a different background,” she said. Taylor was clear that her goal is to earn a Horizon League tournament ring this season. Being picked third in the preseason does not appear to be a worry for someone as thick-skinned as her.